In fishing, timing is everything! Proper timing can give you a huge fish while mistiming can lead you to a big zero! That’s why every fisher wants to keep essential gears beyond their reach, and that’s the reason fishing tackle boxes are worth the money. Just imagine, you need a lure right now but find it after a good ten minutes while accidentally stabbing yourself on hooks! Or you left your gear on the car because you don’t have anything to carry all those! Must be a frustrating scenario, I guess. 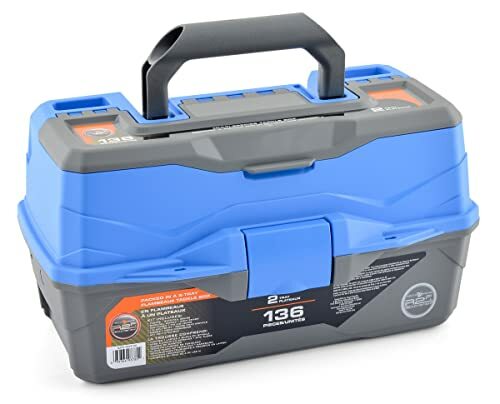 Finding the ultimate fishing tackle box can be a painful job due to humongous options in the market. One has to study the entire market concerning this issue. This is surely time-consuming but good if you can. But who has that much time in this busy life? I guess none! So, we decided to lessen your effort while saving some time. We researched the market properly before selecting our top 10. We have found that the market is full of poor quality products that look super cool. That’s where people make mistakes. But a wise man said never judge a book by its cover! Anyway, let’s start the best fishing tackle box and bag reviews in detail so that you can get the one you dream of. In fishing gear industry Plano is a big name! All the equipment’s made by Plano has excellent quality. All over the world, fishers love to have Plano equipment. This Plano 7771 Guide Series Tackle System is another example of their Excellency. The tackle box is versatile in different ways. Inside the main compartment, you will get four utility boxes. Every box comes with resizable cups for tackles and gears. Also, with the main compartment, you will get a set of small utility boxes that are ideal for jig components. 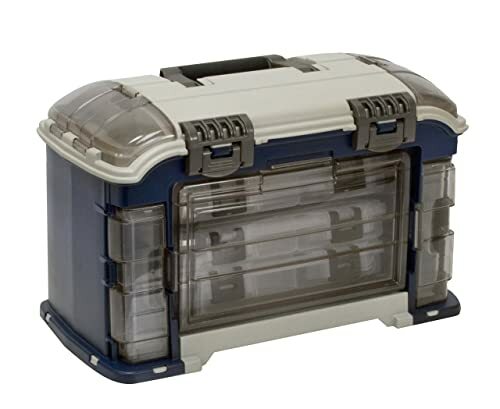 The tackle box also has a clear plastic lid located upfront so that one can see what is inside the compartments. So, one will easily find items whenever necessary. The price of the box is fair enough for such quality. Anglers who needs large tackle storage can think about the OkeeChobee Fats T1200 Tackle Bag. Most of the crazy fishers who loves to have soft-sided bag are using this one at present. It can store up to 8 large utility boxes in the main compartments. So, tons of fishing tackle will not be a problem! The construction quality of the bag is amazing with premium quality materials. It is designed to last. 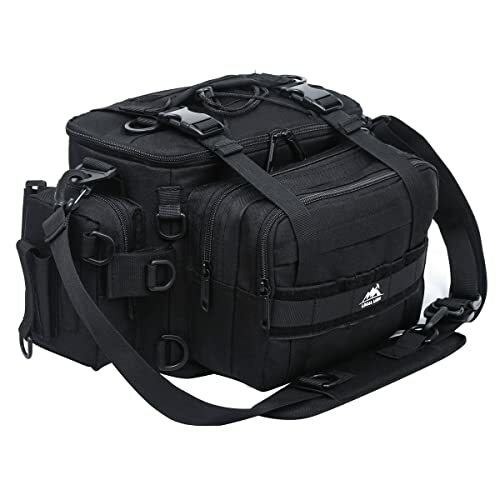 This bag features Velcro neoprene handle and padded shoulder strap. On top of that, the shoulder strap is comfortable and fully adjustable. Each side of the bag featured two large accessory pockets with several sub-pockets. You can fully keep the smallest tackle. In the front side, there is a small pocket featured with elastic pockets for pliers. In this bag, you will also get sunglasses case. Some people don’t want to carry a huge product or too small can’t hold all their needs. For them, Plano Angled Tackle System is the ideal solution. It is a medium size model rich in features but smaller than Plano 7771. It is considered one of the perfect options for recreational anglers. In total, this bag offers 5 clear view storage areas. You can keep bulky gears easily on the top and sides where plenty of room is available. One of the fascinating features of this tackle system is the angled utility box storage. Besides, the item offers clear view windows so that you don’t have to waste much time finding things. The construction quality of the product is fantastic with premium quality materials. Also, it will not slip as it comes with rubber feet. Overall, this tackle box from Plano worth every penny. Grab it before the stock turns out. Want to be more organized in your next fishing trip? Possible if you have the Plano_1374 4-By Rack System Tackle Box in your hand. 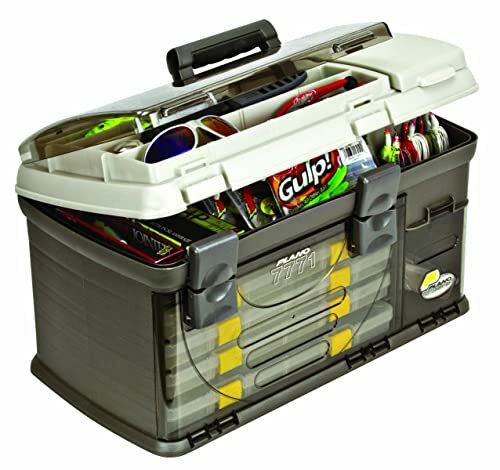 Like the name mentioned it is a rack system tackle box that offers separate racks with visible windows. The construction quality is amazing. It is tested for durability and made in the USA. One of the most highlighted features of the product is its 4-by rack system. Because of this neat storage and easy access anytime is guaranteed. Also, the tackle box fits a 3503 spinner bait box in the bulk storage. You will get four utility boxes of 3700. You can interchange those for customizable storage. The price of the product is fair enough. Overall quality of the product is exceptional in such a price range. So, before the stock turns out, click the link below. With high quality water-resistant 600D nylon fabrics construction, YOGAYET Portable Outdoor Fishing Tackle Bag is another strongest option to look. The manufacturer designed the product to last and to use with ease. It comes with a high-quality buckle made of ABS materials. The zipper in the bag is also high in quality. The manufacturer used industry grade zippers to make the product. Also, you can carry it comfortably with widened and soft shoulder pads. 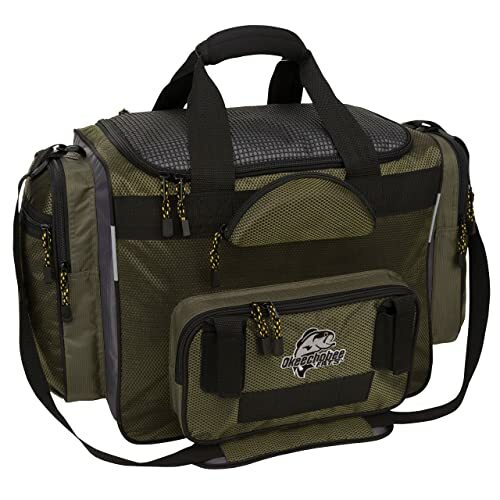 The bag feature multiple storage compartments where you can keep all your essential fishing gears organized. Overall, the price is not prohibitive. If you want this one, be quick, or the stock will expire. 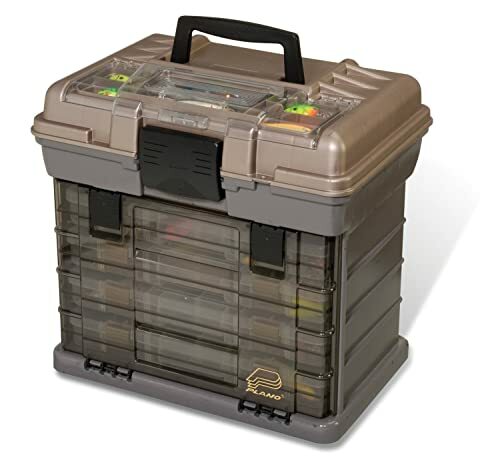 The Ready 2 Fish Tackle Box is ready to tackle all your fishing gears in an organised manner. It is a combo comes with two or three trays that offer enough space for 62 or 132 fishing essentials. The construction quality of the product is exceptional as well. It is made of premium quality materials for long lasting service. However, the item is made by Plano. As you all know, in the fishing industry Plano is one of the most reliable names. So, this product is highly recommended. Anyway, the item comes with a set of hooks, jig lures and sinkers. So, for the beginners, it a dream product to have with a proper guide. The price is not prohibitive as well. LOCALLION Multifunction Gear Sling Pack Hiking Fanny Pack Waist Pack Shoulder Backpack is another fantastic option to look. It is made of high-quality waterproof nylon fabric. The zippers are also high in quality. So, it is ideal for saltwater, freshwater and even ice fishing. 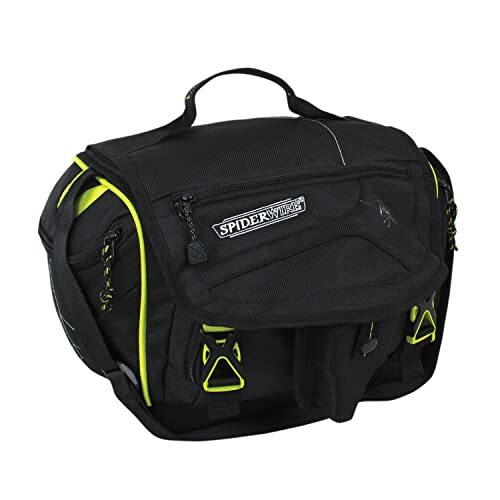 This best fishing tackle bag offers plenty of rooms where you can keep every gear including fishing line, lures, tackle, bait, worms and so on. Still, the product is lightweight and compact so that one can carry with ease. The main compartment of the bag is divided into two categories. Overall, it is a good product available at a reasonable price. It is ideal for professionals. To get the product, you have to be quick. It is a popular item so stock might end up soon. The Spiderwire is another big name in fishing tackle bag industry. Their products are leading the market at present. You can see plenty of Spiderwire tackle bag reviews online. Still, I guess you will not see this Spiderwire Orb Tackle Bag review. It is not because they made it cheaply. It is because the product is new on the market and another underrated item. The construction quality of the product is fantastic like all the above products. It is designed to last and tackle any environment. The bag includes two medium utility boxes and removable pliers holster that features belt clip as well. 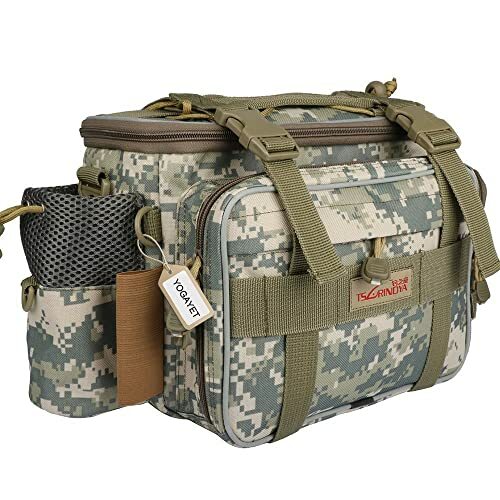 In this best fishing tackle bag, you can keep all your essentials well organised. Three external accessory pockets also included with high-quality zipper closures. All your belongings will stay secure on it. The shoulder strap is comfortable and fully adjustable. You can even remove the shoulder strap whenever needed. The Flambeau Outdoors 6383 is built to tackle any weather condition. It is also made of the highest quality material. So, if you need anything that lasts, this is the product you need to consider right now. It is a classic 3-tray tackle box that keeps everything well organised. 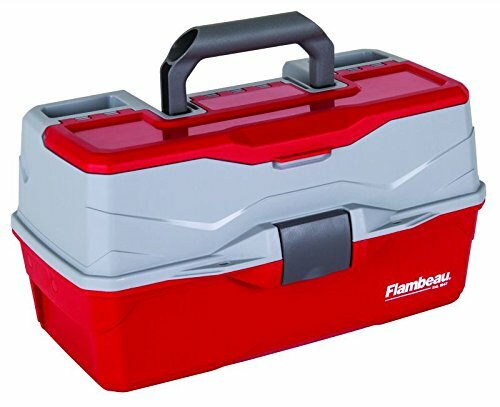 It offers a new lid compartment that moulded into the top of the box. So, the user can access frequently and find their needed item right away. It will save a lot of time of yours. However, the drawitte latch keeps the lid secure, and the tongue and groove lid keep the weather out. The handle of the tackle box is efficient as well. It makes the carrying task effective. Overall, the price for the quality is highly accepted all over the world. The South Bend Worm Gear Tackle Box is the last but not the least option in our best fishing tackle box article. Why is it not the least? Because: it is almost similar even better in some aspect than most of the above products of ours. But still, it is an underrated product as it is basically designed for the beginner fishers. The construction quality of the South Bend Worm Gear Tackle Box is exceptional with premium quality materials. It is designed to last. Besides, the appearance of the product is cute and adorable. The box has multiple storage compartments available with plenty of spaces where you can keep almost every essential fishing gear. The price is reasonable as well. Be quick to grab the product, or you will regret. It a fantastic option for a gift as well. Basically, those are the best fishing tackles of the present time. You can see these products come with excellent construction quality, classy look, good space and a reasonable price. Size: Tackle Boxes are available in a wide variety of sizes from flat boxes to large contraptions. If you are at the beginning of the fishing habit, start with a small clean option. After a few weeks, you will realise what you need. Quality: At the end of the day, only quality talks. So look for a fishing tackle box made of thick and durable fabric. Also, look for reinforced stitching, durable plastic, and high-quality zippers too. Arranging System: Final most crucial factor is the organizing system. 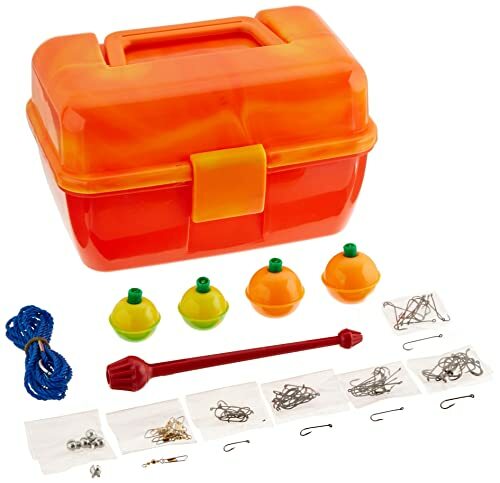 Some fishing tackle box offers multiple options where you can keep everything essentials along with fishing gears. Some other products allow only fishing gears to hold. Think about your need. Along with the reviews, if you consider these three facts seriously, you can make a wise deal. So, now it’s fishing time. Allow me to leave today. If you have anything else to know, comment below. We will get back to you soon enough. Be happy and smile as it’s good for health.